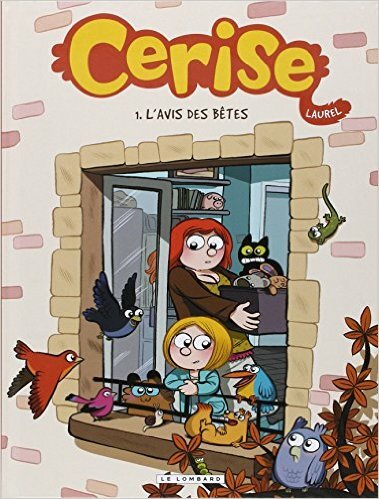 French comics: Cerise, Vol 1-3, by Laurel – Book Reviews by Fred Patten. Belgian, to be accurate. Submitted by Fred Patten, Furry’s favorite historian and reviewer. Cerise. T.1, L’Avis des Bêtes, by Laurel. Brussels, Belgium, Le Lombard, April 2012, hardbound €10,60 (48 pages). Cerise. T.2, Smart Faune, by Laurel. Brussels, Belgium, Le Lombard, February 2014, hardbound €10,60 (48 pages), Kindle €5,99. Cerise. T.3, Le Seigneur des Animaux, by Laurel. Brussels, Belgium, Le Lombard, July 2015, hardbound €10,60 (48 pages). These three albums look at first glance like comics for little children. Well, they are and they aren’t. Mostly, they’re comics that little children should read, but they won’t get a chance to in America. Cerise (Cherry, but the French is a common name in America, too) is a nine-year-old schoolgirl in Noticed by Beasts, the first album. She tries to save a snail from being crushed by a schoolmate. She fails, but the dying snail appreciates her effort and gives her the power to understand and talk with all beasts; mammals, birds, fish, bugs, you name it. The first album is mostly a collection of one-page gags around Cerise and talking animals: her pets (she has two cats and a ferret) and the local wildlife. No other humans believe her, and she boasts of her “secret ability”. In the last two pages, she meets Arthur, another boy who can also talk with animals. Volume 2, Smart Animals, turns serious and into continuity. (Warning: there are spoilers from here on.) Cerise can’t find Arthur again. She loses most of her playmates and is taunted at her school because she’s “crazy” for claiming that she can talk with animals. The other children won’t give her a chance to prove anything. Thaïs, her only remaining friend and the only schoolmate who believes her – she talks Thaïs into helping her look for Arthur – turns out to be crushing snails to be able to talk with animals, too. When Cerise finally finds Arthur, she learns that Thaïs located him long ago but never told her. She learns that her new “animal friends” practice the law of the jungle. She has a hard time talking with birds without one of her cats trying to kill them. She can hardly get acquainted with anything wild before it’s eaten by another “friend”. When she finally finds Arthur – his mother runs a small stable and riding academy in the nearby countryside – new complications ensue. Volume 2 ends with the revelation that there’s a third child who can talk with animals, and that the “animals’ goddess” who is responsible for the three childrens’ power may have an ulterior motive. I can’t think of anything to say about volume 3, The Lord of Animals, that wouldn’t be a super-spoiler; but the story becomes darker and more grim. Among its minor revelations is that all French kids today who spend lots of time communicating online on their laptops are learning English because that’s “the language of computers”. That’s nice to know. Volume 3 ends with all three children (that should be “children”; Michel is 15 years old) meeting each other, and with more to come. 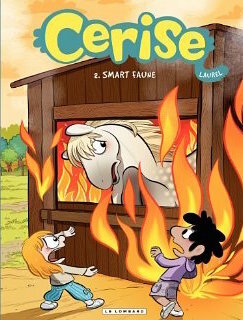 Cerise may be for French children, but it has some eyebrow-raising elements. Cerise addresses her parents as “Mommy” and “Adrien”, implying that Adrien may be her mother’s current husband but he’s not Cerise’s father. 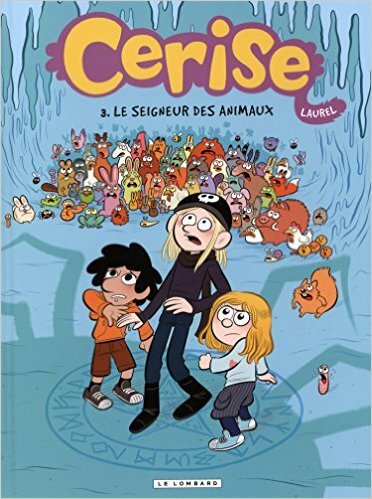 Cerise doesn’t have a laptop or a cell phone like most modern French kids (this is an important plot point) because her parents believe they give off harmful “electronic waves”. There are Americans like that, too. Cerise lives in Metz; the capital of the province of Lorraine. Students of history will remember that the German Empire and the Nazis both annexed Lorraine (France got it back), and Metz was the scene of some of World War I’s dirtiest trench warfare. This is significant because Cerise has local Metz references, and the French in Cerise is full of what I assume is local dialect and current French slang. It’s not incomprehensible – after all, these albums are intended to be on sale throughout France, Belgium, Quebec, and the French-speaking part of Switzerland – but you have to work at it if you’re mostly familiar with textbook French. Adult fans of anthropomorphic comics will not feel that Cerise is too young for them. A Google search says that author Laurel is Laureline Michaut. She has an entry in the Dutch Comiclopedia. She was born and grew up in Metz, which explains a lot. She lives in San Francisco today, where she designs video games, draws French comics and sends them to France & Belgium for publication, has a blog in both English and French, and is active on DeviantArt. I don’t know why only volume 2 is available in Kindle.